This is the idea behind "Life’s Little Things: The Quotes." Cendrine Marrouat’s second book in her "Life’s Little Things" series pays homage to the world in a way that you may never have seen before. Each page is an invitation to reflect on the human condition and our never-ending connection to nature. Not only will "Life’s Little Things: The Quotes" brighten your day, but it will also open your mind to what is possible and what truly matters. In a world where negativity seems to be winning, the 25 high-quality photos and quotes in the book are intended as a balancing act. They will encourage you to reconnect with yourself, think more positively, slow down your physical pace, and find your inner rhythm. 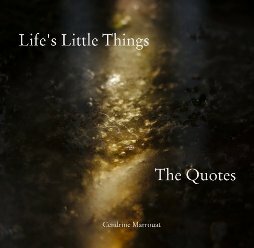 "Life’s Little Things: The Quotes" is a little book with a twist and a big heart. Don’t wait and pick up your copy today!